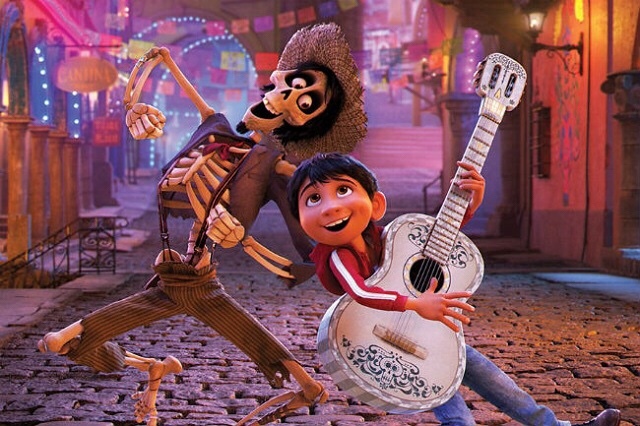 Disney’s 2017 movie Coco follows the adventures of a young Mexican boy whose family abhors music. Miguel, in a desperate attempt to enter a music contest to display his hidden talents, steals a guitar from a famous musician’s mausoleum. He picks the wrong day to do this: it is Día de Muertos, Day of the Dead in Hispanic culture, and the guitar ends up being cursed, transporting Miguel to another layer of reality where the dead walk among the living. Miguel seeks to reverse the curse by finding a family member who loves music, while avoiding the rest of the family who abhor it. I won’t spoil the plot points, but I do want to draw out one plot mechanic. We find out that the Land of the Dead is not final: they only exist in this magical world of community and music and yearly visitations of their living families because they are remembered in some way. The ones that are remembered on their family’s Ofrenda (altars remembering their ancestors) get to walk among the living and see how everyone is doing. The ones whose pictures are not placed on ofrendas, but have living family members who remember them, they do not get to see the living, but they do get to exist in the Land of the Dead. But then what happens when the living die or forget the dead? They disappear from the Land of the Dead, and go on to something beyond (“nobody knows”). This is a plot element where there is a race against time to save a character from being forgotten and thus departing for the great unknown. Coco is a story about family and adventure and Latin culture, but it is also a story about the importance of memory. By the end of the movie, we see that a malicious unjust memory endured in the living world, and only Miguel can set it right by escaping the dead world and telling the truth. Coco helped me think through an important part of the crucifixion of Jesus that I had not thought about for a while: the Empire’s efforts against memory and the importance of witnessing. In his new book How the Death of Jesus was Remembered: Inventing the Passion, Arthur Dewey brings up an element of the crucifixion that also deals with memory. What a word: liquidated. Crucifixion liquidated a human being, destroyed their form such that they ceased to have even the contours of humanity. The Empire’s purpose in crucifixion was deterrent and detergent: to discourage dissent and to wipe away the memory of any other qualities of the dissenters. Fear will keep the townships in line: fear of Calvary’s hill. By manipulating memory and supplanting human stories with their manufactured ones, the Empire asserts control over an essential element of humanity: our memories. Coco and the Cross teach us about the value of memory and witnessing. Coco personifies the value of memory, giving a unique tangible benefit to telling the right stories. The end of the movie has Miguel set the real world to rights, and lifting up his entire community to new heights. A rising tide lifts all boats, but the tide requires the gravity of memory to move it. Witnessing to the truth benefits the whole community. The Witnesses to the Cross perform a similar role. The disciples were scattered but his mother and others were there, weeping. The women who saw the empty tomb later went and told of the enduring life of Jesus beyond death. Even the Roman Centurion was impacted by the experience in a way likely hundreds of previous executions hadn’t touched him. The Jesus story endured not only because of God’s intervention in the swirling circles of human depravity. It endured because of the human capacity for memory and witnessing to stories that tell the truth. And like Coco, the whole world community is bettered from the telling of such stories. Humans have a funny relationship with memory. We tend to remember the really good moments or memories – with a halo effect that obscures some of the less favorable specifics. Perhaps “time heals all wounds” because we forget some of those injuries. Only trauma burns the really bad moments into our memories, and those are harder to forget, even if we spend a lifetime trying. That’s one reason why these Gospels have endured while other competing gospels did not. I would say these Gospels are more human. The authors should have recalled only the good things and the final trauma. But the Gospels include the stories of when the disciples failed, forgot, misunderstood, and ran away. The bad stories are told alongside the good…even in John where Jesus is more superhuman than human. The Cross reminds me that we endure our dark days of hopelessness by telling stories. We remember. We tell the stories of our real lives and family drama. We sing songs of liberation. We keep people and loved ones from fading to obscurity. We paint real pictures, warts and all. Remembering well is the Christian answer to the Empire’s Cross. May we do the work of remembering today, telling even the stories that hurt in their honesty, so that our faith can endure through tomorrow. Note: I am indebted to Awe and Wonder, Here and Now Issue 6 – The Crucifixion for the Dewey citations.